Stock photos tend to have a cheesy, low-quality connotation and often for good reason. However, as a small business owner you have a huge need for photography, especially for your website. Budget and time constraints make it difficult to hire a professional for every photo need, and that’s where stock photos comes in. Fortunately, we’re past the days of expensive stock photo subscriptions and tacky images. There are many great stock photo sites out there now. However, finding great photos is only half the battle. The next step is knowing how to choose the right ones for your brand. Below you’ll find the best stock photo sources available and guidelines to help you curate images. If your business is new and you have a tight budget there are plenty of free stock options. The following are some of the best. Many of them have the same images, so it isn’t necessary to search all of them. The downside with free options is that you’ll see the same images used by many others, but for small budgets these are a great place to start. Note: Most of these are free for commercial use, but always double-check the terms and conditions before using them yourself. If you have the budget to buy photos the list below is chock full of gorgeous, affordable imagery. Many of these options are small, independently-owned businesses, which means you can’t purchase their photos anywhere else. This is a great way to find high-quality photos that aren’t over-used. With the list of sources above, finding good photos is no problem. Choosing images that are cohesive and on-brand is another thing. 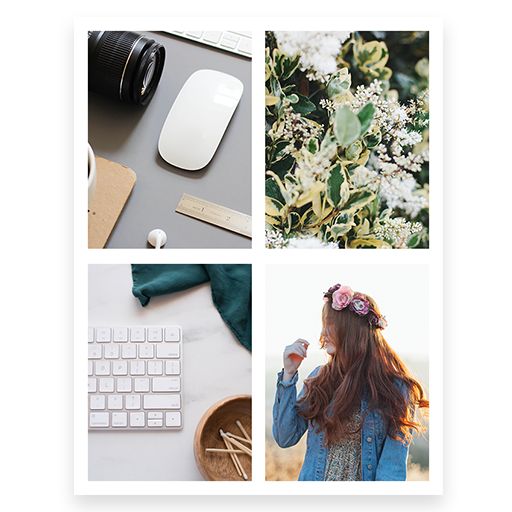 Here are some guidelines that will help you choose the right photos, specifically for your website. Strong photography is a great way to immediately draw viewers into your site and the right stock photos can do that. Before you start your photo search it’s helpful to know what you’re looking for. Make a list of all the pages on your site that need a photo. Brainstorm the kinds of images that would work. Consider whether you will have a slider on your homepage or if you only need a single image. With your list of needed images you now have some search terms to use as you hunt for stock photos. Use them on your website, blog, social + more! Using your brand colors is a great way to ensure that you’re staying on brand with your images. Although it's great if you can find photos with your brand colors, it's also ok to branch out to a broader color palette. For example, a neutral palette, a bright palette, or a pastel palette. Many of the stock photo sites on the lists above will allow you to search by color. Here are two examples of websites I designed that relied heavily on free stock photos. Notice that they each have a distinct color palette, reflected in the images we used. The next way that you can ensure you’re choosing the right photos is to define the subject matter that will align with your brand and speak to your ideal audience. Should there be people in the images? If so, what age? Are they smiling or serious? What kind of clothing are they wearing? These kinds of decisions will depend on the personality of your business. If you want to be seen as approachable, having images of smiling people is a good way to convey that. If your business is more on the mysterious side, consider using images with just a hand, and no faces. Next identify a photography style that will best represent your brand. If your business is approachable and feminine, soft and airy photography would work well. If your business is serious and sophisticated, consider a darker, moodier style. For a fun and playful brand use bright, saturated images. When you’ve established the style that suits your brand, look for stock photos like that. Colors - My brand colors are black, tan, and pale gray. So I use images with neutral, unsaturated colors. Subject Matter - Since my clients are primarily female small business owners I choose images of women in their mid-twenties to late thirties, looking happy, thoughtful, or working on a computer. I also include images of laptops, workspaces, or stylish desktops that my ideal client can relate to. Style & Mood – My brand is refined and sophisticated so I stick to photos that are a little darker and shadowy. It’s important that my brand also feel relatable and approachable. To do that I use really crisp images that feel realistic. Faded or airy photos would be too dream-like for my brand. Another good way to ensure that your photos are always on brand is too narrow your search to one photo site or a single photographer on that site. I find all of my stock photos from the same site. When I find an image that works well I check out the rest of the photos by that photographer. This usually provides me with multiple images that will work well for my brand and have a similar style. Another way to build up a library of consistent images is to buy a photo bundle or pack. Many of the stock photo sources on my list offer these. They will typically be by theme and include a lot of images for a great price. I recommend looking into these if you have a need for photos on a regular basis. Now that you know where to find the best stock photos and how to choose the right ones for your brand, start building up your photo library. That way you’ll always have images on hand when needed. A little bonus, to get you started we’ve included 15 free photos courtesy of Marlena Pearl Photography, Photo Firm and TwigyPosts. Grab them below and enjoy! Do you have a favorite website that we listed or a new one we didn't mention? Leave a comment, we'd love to hear your thoughts! Disclaimer: You are welcome to use these stock photos on social media accounts, websites, or anywhere else you might need them. Do not try to resell any photos as your own because each creator is still the owner of the copyright for their photos. Also, do not redistribute the photos. Beyond this, have fun and make the most of these images!